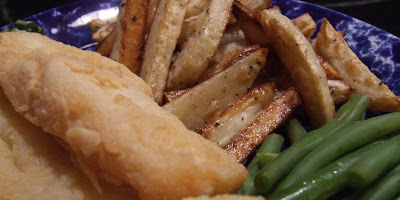 When I found Tyler's recipe for Fish and Chips, I knew it was going to be my first recipe for Tyler Florence Fridays! And it did not hurt when I found some gorgeous Cod on sale either! I love Cod and it's such an over looked and unappreciated fish. The fish is such a gorgeous white and so flaky and you can do just about anything with Cod and it's always good...poach, saute, deep fry, bake, sauce, it does not matter Cod can handle just about anything and it always shines through. Needless to say Tyler's Fish and Chips was delicious and I loved every bite. Mr. Tastebuds said "I did not think I liked Cod, but this was pretty good. Can I have another piece?" I guess I forgot that he did not like Cod, but he sure likes it now! Using seltzer water and rice flour gave the breading the most amazing crispy texture and after frying the breading had a nice crunch and not oily at all. I can't wait to try it with shrimp and I've been thinking about making frog legs lately too. WOW...the batter is the best! Also I did not fry the chips per the recipe but made Oven Fries instead. Heat 3 inches of the oil in a deep fryer to 325 degrees F. Alternatively, use a deep heavy skillet. Peel the potatoes and cut them into chips (that is, fries) about the size of your index finger. Put the potatoes in a fryer basket and lower into the oil. Fry the chips for 2 to 3 minutes; they should not be crisp or fully cooked at this point. Remove the chips to a paper towel-lined platter to drain. Crank the oil temperature up to 375 degrees F. In a large mixing bowl, combine the flour, baking powder, salt and pepper. Combine soda water and egg and pour into the flour mixture. Whisk to a smooth batter. Spread the rice flour on a plate. Dredge the fish pieces in the rice flour and then dip them into the batter, letting the excess drip off. Put the chips in the bottom of the fryer basket and carefully submerge in the hot oil. Carefully lower the battered fish into the bubbling oil on top of the chips. Fry the fish and chips for 4 to 5 minutes until crispy and brown. Remove the basket and drain the fish and chips on paper towels; season lightly with salt. Serve wrapped in a newspaper cone with malt vinegar and/or tartar sauce. NOTE: This recipe makes quite a bit of batter for the fish. Next time I will cut the batter recipe in half and I'm sure I will still have more then enough! **NOTE: 2 tsp of salt is plenty. Just found your blog. Love it. Love all things Tyler. This recipe sounds terrific! Your cookies look awesome also! this looks deliciously crispy - I'm not always happy with my homemade batter and continue to search the perfect recipes ...could this be it? Wow your fish and chips look very tasty! I have a fear of frying but I might have to make these now- thanks for visiting me and leaving such a nice comment! Cod is one of our favorites; in fact I think my husband loves it the best. I'm a halibut girl, but we both will eat most any kind of fish. Your dinner looks great! Love your blog. Excellent choice - and so glad you joined our little group! Converting your hubby - now that is the mark of a good dish! Love, love, love fish and chips - I definitely see this one in my future... as soon as that cod sale hits! Beautiful fish and chips! I love all kinds of fish, but am a big fan of cod for fish and chips. Welcome to TFF! this would be a hit with my boyfriend, i'm sure. he used to meet his dad every friday for fish and chips. it looks really good. I really love fish and chips but never attempted to make it at home. This looks lovely though, and I think the idea of a rice flour and seltzer breading sounds intriguing. Maybe I will give it a try. I did not even have a deep fryer until we started our construction. And set up a temporary kitchen sans oven and used it for about 1 1/2 years. I had a toaster oven, hot plate, slow cooker and then I bought a Fry Daddy. The only thing I don't like about deep frying is the lasting smell in the kitchen. I don't deep fry often so I set up an area in our exterior room for my deep fryer so I can keep it outside as much as possible. Wonderful photo...who would not love to sit down to that plate??? Man o man ... does this look good (and easy) or what?! I need to go out and get myself a candy thermometer, so that I can control the temp of my frying oil perfectly. I hope to make this recipe soon! Thks for sharing. Found you on TFF btw. Thanks so much for posting, and the fun news of your family and home.